You don’t need to be doing a major refurbishment when you come to Amos Beech for advice. 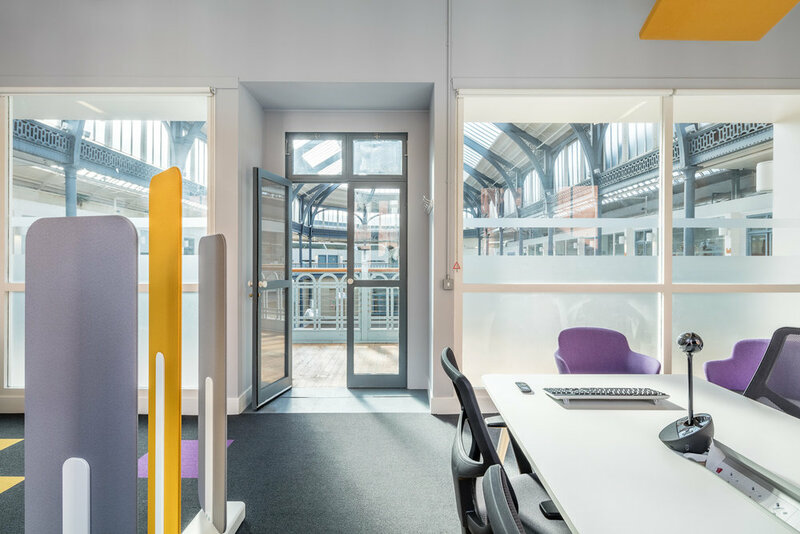 This was demonstrated earlier this year when Help Musicians UK approached us to provide interior design ideas and costs to refurbish a small office that they had taken a lease on in the Briggait, Glasgow. The Briggait, in Glasgow’s Merchant City was built in 1873 and was once the city’s fish market. 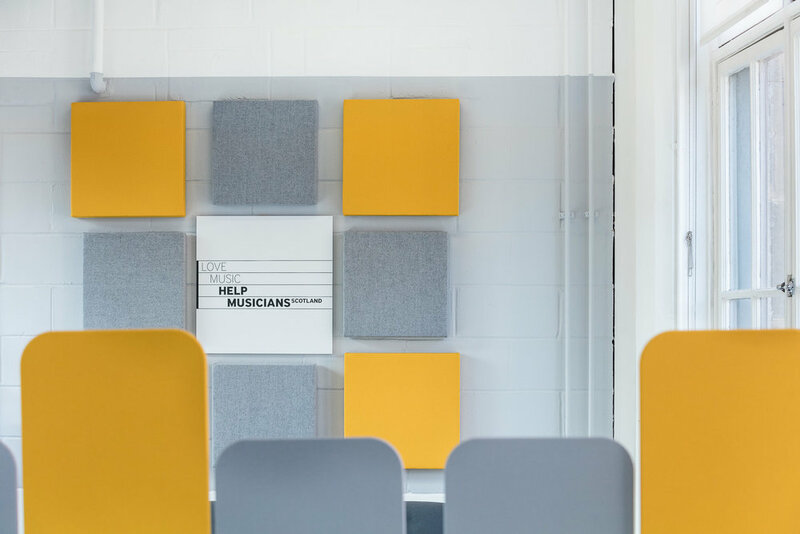 It now houses creative and cultural organisations including workspaces for artists, so the choice of location for the leading UK charity for musicians, seemed perfect. 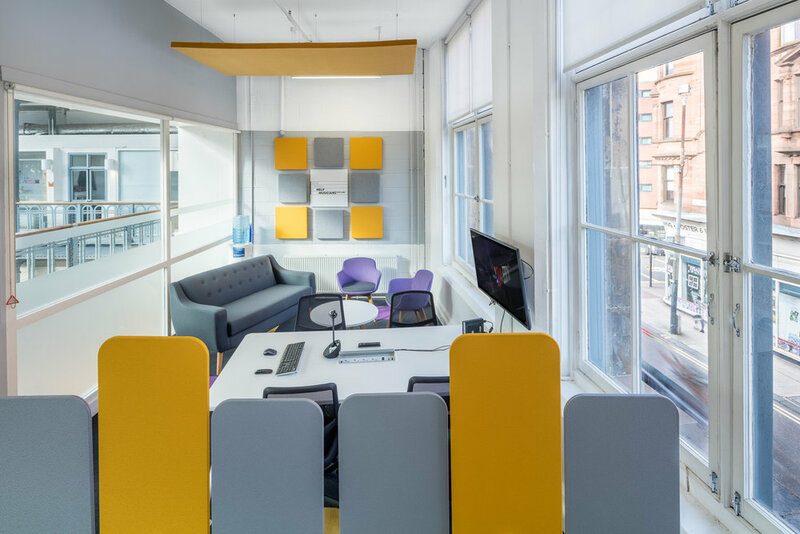 The size of the unit was only 387.5 sq ft but the charity had a need to create an environment that offered desk space for their Scottish staff, as well as a hot desking area for visiting staff and a small breakout area. Importantly, the office area had to reflect the branding of HMUK , in particular their logo and colour scheme. The interior design team here at Amos Beech worked closely with HMUK’s London based Operations Officer and produced interior design schemes which included furniture layouts and colour suggestions for flooring and fabrics which kept in line with the brand guidelines. Also taken in to consideration was the need for AV facilities to allow for video conferencing. The building itself being over 100 years old comes with high ceilings and beautiful tall windows. However, this feature challenged us in terms of acoustics and so we suggested ceiling hung acoustic panels again in the strong brand colours, which helps in some way to absorb sound. What has been created is small and concise but really packs a punch and the just demonstrates that no matter how big or small your project is, the team here at Amos Beech can deliver. A bigger forest and more wildlife thanks to Axon Cable! Our Grove in the Scottish Highlands has just grown by the size of The Mackenzie School of English's new space! The forest has just grown by the size of CitNOW's office! Planting a tree should be simple! New branding, new website, well new everything! Working at a desk is just as bad as smoking? Every two years the European furniture industry gathers in Cologne to see and discuss the latest trends and developments in furniture and interiors. Well that's what they say anyway. It is also very much a networking event and the British organise their own parties and traditionally finish the evening off at Papa Joe's to get the real industry news! The Orgatec exhibition has grown over the years from a local German office furniture show to a truly international interior design Mecca and therefore two members of our design team, Cigdem and Deborah set off to Germany to get inspired. Design Mecca or not, The Orgatec in Köln may be an international show but lacks the exquisite detail that the Furniture Fair in Milan has to offer. We also expected to be able to pay by credit card wherever we went but hey, we are flexible! We were impressed by the shear size of the place though and we had an amazing time! The things that inspired us as designers were mainly the involvement of Biophilia in stand designs and also the use of wood in products within their context. They showed that it is possible to integrate Biophilic Design in office environments because it really does make a difference in your health, efficiency, motivation, creativity and overall mood. Wood finish used in legs (chair & table) and work tops were very popular and clever in how it was implemented. Different shades and grains were considered to suit its context. A wood finish always gives a calm feeling. Greenery, plants, trees were freaking everywhere, we fell in love! The one we remember most is the pomegranate tree at the Actiu stand. The stand designers also used a lot of relatively inexpensive raw materials in an innovative way i.e. painting of sterling board/chip board, cardboard tubes and also exhibited unfinished metal. The shift from corporate workplace “desking and task seating” to much softer timber pieces enhances a different way of working. On the office furniture side many of the big players relied on their classics and didn’t bring anything fresh to the table. Don’t take this the wrong way, we LOVE the majority of these classics but thought they needed to up their game a bit. Our industry dinosaurs Sam and Vincent, who joined us for a day felt exactly the same, but also pointed out that there were a lot of sit-stand desking on display, even on design brand's stands, hoping that this would now finally mean a breakthrough into the mainstream market. Acoustics was another big focus at Orgatec. This was very smartly integrated in decorative office ornaments, ceiling rafts, desk screens, pods and even lighting. We also loved the curtains! The ones made of interesting materials – chainmail, rubber, etc – a very cool way of bringing a domestic feel to the workplace whilst still being practical way to divide spaces. The general hospitality was excellent and we had an awesome time. It’s about so much more than just finding new products. We felt the stand design and networking side to be just as inspiring and very much look forward to Orgatec 2018! So, once again there are some sensationalist press articles. This time telling us that working at a desk is just as bad for you as smoking! And then we all start thinking how it must be true because we read it in a respected newspaper and the research has been done by a health organisation. Now I am not going to rubbish research that has been carefully quantified, qualified and presented, but to blame it on sedentary work seems a little severe. Genetics, diet and living conditions all play a massive part in our health and I would be interested too in which countries most of the 5.3m people who die annually actually come from. What we can say is that poor posture at work does contribute to more health problems than just back related. When we go from standing to sitting in the merely average chairs that have been offered to the market since the synchro chair was first introduced in the 1970's, we have seen a massive increase in all kinds of problems and these have increased significantly as PC usage became the norm. There are real alternatives although normally (in the UK) management teams and accountants have not seen the whole life cost and the productivity improvements in their true light. Were they prepared to spend another 20-30% on the task chair that their single biggest asset and investment sit on every day then the result would be more than seen on the bottom line results of their company. Interestingly, as we move from the traditional 3 part office (desk space, meeting space, canteen) to the new collaborative, multi-functional and connected office allowing us to work anywhere, anytime, we are not sedentary any more. True, there are some office workers who will never change their ways they are working at a desk and can get to work in their sleep, moving from bus to underground to pavement to desk through muscle memory but they are a reducing minority! For the rest of us, collaboration, communication and sharing of ideas is the way forward because to survive in a global economy then change is the only thing we can be sure of and this also means changing our posture too! Maybe, subconsciously we have returned to the hunter-gatherer work/life pattern that our ancestors enjoyed but without the sabre-toothed tiger on our back! So good-bye sedentary, and if you are interested in bio-mechanics and how this can be integrated into 'proper office task chairs' drop us a line! As we near the end of our inaugural participation in Double S Events' DesignPopUp, Glasgow, we can already say with confidence that it has been a great occasion! The Amos Beech team all thoroughly enjoyed it, especially the Parmesan and Prosecco evening, of course. (According to one of our team members Parma cheese is actually Dutch cheese with a little bit of Parma treatment, as is Parma ham he reckons, but we tend not to take him too seriously). Sara and her team pulled off a great event again at The Briggait in Glasgow’s Merchant City. A wonderful building with an abundance of natural light. It is a rare luxury to have an exhibition in a hall where you see the colours and surfaces of furnishings and textiles changing along with the time of the day. The Briggait was the city’s fish market for over 100 years, fortunately is was just the incredible Parmesan that touched our senses. The acoustic panels from Friends of Wilson we displayed drew great interest from the visitors. No wonder, they looked brilliant on the stand and they will contribute to an inspiring and relaxed office environment anywhere they're installed. Friends of Wilson architectural panels enhance interiors whilst reducing unwanted sound. One of the manufacturers we are showcasing on this year's DesignPopUp is Actiu from whom we have pieces from 3 different ranges: Badminton, Prisma & Longo. Badminton (above) is a kind of throne that impresses with its size and shape and envelopes the user with comforting acoustic prowess. It has a wide range of design possibilities thanks to the ability to select different colours, textures and finishes of both the shell and interior. "The Badminton easy chair is pure concept. It represents our strong commitment to sophistication, captured in a striking, immersive piece with a completely innovative design and architecture." Javier Cunado. Prisma's finishes evoke a Scandinavian style, characterised by clean lines. Outwardly it hides complexity in its structure. The junction of its top and legs, in a pyramidal shape, give the appearance of a single piece. Elegance and minimalism merge in this range addressing today's work-spaces with warmth and distinction. An exciting element of the Parmesan and Prosecco evening was the arrival of the acrobats from Aerial Edge, also based at the Briggait, who we engaged to perform in true Actiu style. If you have put your business card into the big glass bowl then you may even have won it, so watch this space! We will announce the winner within the next two weeks. If you click on the photo above, you will get access to all the photos. Looking forward to seeing you all next year!